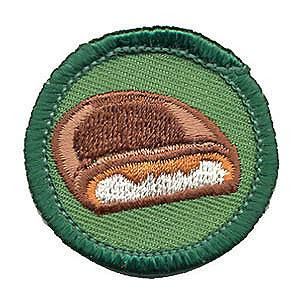 If hunting a Girl Scout was a possibility for a badge, I’d deserve it. I’ve spent that last few weeks seeking out little girls (that sounds gross) selling the delicious goodies. I thought this would be an easy perk of living in suburbia, but it was totally a challenge. Then, while making a trip to Sam’s Club for birthday party supplies, there is was (cue angelic music). That golden table of gals selling cookies. I knew I would need to hit this up on the way out. I must admit, I was a Girl Scout for two years. I even went to a camp (hell). BUT, one thing I did dominate at was cookie selling. In fact, thanks to my mom, I was the number one seller and got a special badge for that. WINNING! So in honor of those delicious, crunchy, sugary delights, I wanted to honor them with a liquid version this Thirsty Thursday. Mix the vodka, kahlua and bailey's and pour over ice. Pour the creme de menthe down the center of the glass. Looks gross, but tastes delicious!